The wily veteran got caught out by a returning Grado this week, but not before employing some classic tricks to try to get one over on his opponent. I know Snow isn’t going to have a run that sets the world on fire, still though I really like his grizzled heel character and I hope it continues. The challengers for the tag team titles got a sneaky win this week and managed to blindside the New Day on Raw during their mostly-terrible time travel sketch. Segments like that make me worried for the New Day as it seems like they are just allowed to do anything they want and that is never a good road to go down. 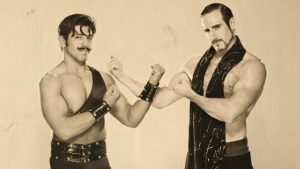 Whatever the case, the Vaudevillains have been doing a lot better than I thought they would after coming onto the main roster, I thought they would go the way of the Ascension, and continue to garner real heat as they progress through this program. Now all they have to do is win the damn titles. While I’m not going to use the WWE’s lame combo-name for this heel team I do happen to love this pairing. Both men are victims of being given a gimmick and then not being allowed to truly work it so giving them a shot as a tag team could give them a great way to rally and recover. I’m also a big fan of both men, especially Johnny Curtis, who I have liked since the original NXT (his character was he owned a van), so this kind of reminds me of the Rhodes Scholars, where two guys are thrown together and have the potential to be a truly great tag team. I just hope they are given a better run than the Scholars were, RIP Damien Sandow’s WWE career. I like that Decay are working like the Wyatts, where they have their own agenda but are also not unwilling to work for someone for the right price. Sure it seems like this team are anti-everything in society, but adding to the corruption of TNA for money counts towards that in my opinion, especially if it involves attacking Jeff Hardy. On a side note; Charismatic Storm, really?! The ego on that guy is insane. Jeff Hardy might be the only guy other than John Cena that when he gets injured I say “good” because I honestly can’t stand him and he is too popular to ever go away of his own free will. The Decay retained their titles despite this popularity and they look set to be a big part of TNA from now on. It’s hard not to think that the Miz’s days as champion are numbered. Unfortunately, while the rivalry between these four men is actually great television, his relationship with his wife has taken a backseat and now feels near pointless. As such, instead of the addition of Maryse being a mid-card renaissance for the Miz, he mostly feels like a placeholder before a true champion is crowned. Of course this might not be the case and maybe Miz walks out of Extreme Rules with the title, but I just can’t see it since all three other men would make much better champions at the moment. Also who the heck is he supposed to go against for the title after this if he does win? While one heel is looking certain to lose their title on Sunday, another looks certain to win as Rusev has managed to get one-up on Kalisto at every turn this week by picking on and taking out his buddy Sin Cara. I’ve never really seen the appeal in Rusev and he hasn’t grown on me. I just don’t respond to the foreign heel yelling out stuff in another language to get heat, at least when there is nothing else to back it up. Despite this there are those out there who are big Rusev marks and I suppose there is a place for him on the roster, I’m just not sure it matters for him to be US champion again at this point. All we will get from a win here is more anti-American rhetoric and considering the timing we might just be launched straight back into a Cena-Rusev feud for the title. Oh joy. I was pleasantly surprised by Dana Brooke this week. On NXT I was generally not a fan of Brooke but somehow on the main roster her douche-bag character works, maybe because women on the main roster can’t be more than two-dimensional without being kept off TV a whole lot. What’s more she managed to win both her matches against Becky Lynch on both Raw and Smackdown, once with Emma’s help when it looked like they were set to become a dynamic duo, and once on her own once we learnt that her partner had been taken down as the latest in a long line of serious injuries. It is still very early days yet for her and her act might get really old, really fast, but for now she deserves her place on the chart this week and I think is a good addition to the women’s division. This is especially true now that half the women on the main roster seem to be down with injuries. Put a lunatic in a strait jacket and you get what you deserve, Jericho is now booked in the first ever Asylum match and could be the catalyst for Dean Ambrose to finally reach a firm main event level in the WWE. As I have stated many times before, Jericho is not long for the WWE and after losing last month at Payback you have to believe that he is now going to take a major beating and be seen to be put out by Ambrose in this match in the most brutal fashion. If not then it is a terribly wasted opportunity. Jericho has been doing some good stuff in his latest run and remarks like his jacket is more important to WWE history than Andre the Giant are pure gold. Still though I won’t necessarily be sad to see him leave as while going against him gives some less established stars credit, his presence will never be permanent and so there will always be the argument that his place on the card would be better utilised by one of these newer guys. Why are veterans assumed to be the measuring stick for younger guys? Why can’t we put in someone new as the measuring stick for this ‘new era’, just like EC3 has become for TNA in his relatively short career there? It can be done, so why not give it a try if you are truly committed to building new stars? 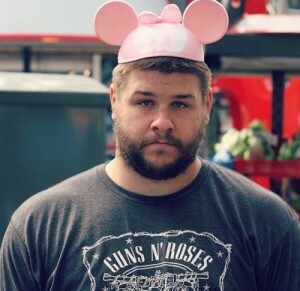 While I have just advocated for the end of Jericho’s latest WWE run I realise when considering Kevin Owens that such a thing makes me sad. Not only will it mean that we will have only seen the awesomeness that was the team of Owens and Jericho once in this whole time, but that it will also mean a premature end to the rivalry between the two on this chart. Each week the two have battled for the top spot and usually placed very close to one another, one pipping the other at the post on several occasions. Without Jericho, I’m not sure who will come close to dethroning Owens in the near future, possibly Charlotte, although her booking is so spotty that her bursts will probably not be able to outstretch his consistent points earning. In related news, did anyone else see the report that Owens might possibly have been injured over the weekend? Luckily it doesn’t seem to have been anything serious but that particular injury could have killed this report dead. Who would have replaced our weekly Owens greatness, Baron Corbin?…Hahahahahahahahahahahahahahahahahahahahahahahahahahahahahahahahahahahahaha! (I nearly just gave myself a heart attack) Seriously though, it was great to see Owens team up with Sami and I liked that they acknowledged his general character trait of walking out on tag matches when he can’t be bothered anymore. I am slightly worried that putting Owens with Zayn is a shortcut to turning Owens face and certainly the fans responded to his hot-tag segment, but luckily his super kick to his partner after the match brought everyone back down to earth and we hopefully won’t be getting a face Kevin Owens any time soon. Also a highlight was definitely after the match when he made the ref raise his hand and started to claim that he won the match rather than Zayn, plus you know, six-star frogsplash. Despite my love for Kevin Owens it is hard to deny who the top heel was this week, in fact you might say there would have been Grave Consequences had I not given this man his due. 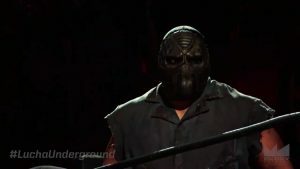 Lame jokes aside, Matanza managed to hold onto the Lucha Underground title this week in this version of a Casket Match against Mil Muertes, making it now two-out-of-two losses for that man in this type of match. The brutality in this match was great and I still marvel at how much better Lucha Underground, a promotion that many would probably (wrongly) stereotype as being all about flippy little guys, is able to book monster vs. monster matches than WWE. While Vince McMahon would love to just showcase giants butting heads all day, he doesn’t seem to care enough about building them to the point where both men seem unbeatable and have the talent to actually put on a match that people want to see. I can’t remember the last time I saw a big man vs. big man match in the WWE that I was actually excited for. This contrasts to LU where both times these guys have met I legitimately mark out and I am not even really a fan of big guy wrestlers, even so the characters have hooked me and I buy into the matchup completely. To me Lucha Underground (if it is allowed to continue for multiple seasons) has a legitimate shot at reaching that Game of Thrones level of compulsory viewing since the intertwining storylines have room to develop and deepen infinitely. I’m not saying the product is completely there yet, but the elements certainly seem to be in place for this to continue. I am now highly intrigued not only to see what is next for Matanza, but also what this loss means for Mil Muertes. Will he come back more powerful than ever? Will it be as a force for good or an even bigger evil than before? What was with the presence of King Cuerno? And who the hell is the man/monster/master in that limo?! That’s all for this week, barely any movement on the Rolling Chart this week, which is a first. It looks like the New Day and Wyatts are on their way out overall and with Jericho leaving it will be interesting to see who can rise up and take the top spot any time soon. What we need here is some consistency since a lot of heel acts have a good week or two before either not being featured on a promotion or losing steam. This can all change in a blink of an eye, but for now it looks like there will be some stagnation, at least in the centre of the chart. 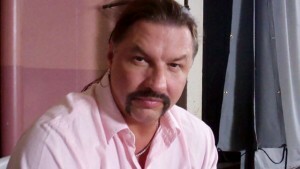 Personally I’m hoping for Al Snow to become the biggest heel in all of wrestling right now, we’ll just have to wait and see.